30 day challenges are my favorite way to build or break a habit. They’re simple, they promote instant positive action, and they’re not overwhelmingly long. Obviously, as the creator of 30 Day Challenge Dude, I believe in the power of the 30 day challenge, but why should you? How can you leverage the power of the 30 day challenge to promote positive change in your own life? That’s what we’re here to talk about! I love writing about my own experiences with 30 day challenges, but I believe the main goal of this blog is to spread the message that positive change in your life doesn’t have to be complicated. I want to enable everybody with the simple tools they need to start improving their habits and lifestyle. It’s as simple as setting a goal and taking action. So let’s do this! Let’s get you started on your first 30 day challenge. Before you start, I think it’s important to gain at least a basic understanding of why 30 day challenges are such a powerful tool. I firmly believe that understanding WHY you’re doing something helps keep you motivated and on track. With that being said, you can find 6 reasons that 30 day challenges are so effective below. If you want more detailed explanations of each reason, be sure to check out my post on The Simple Power of the 30 Day Challenge. I personally love 30 day challenges because they are so damn simple. Pick a habit. Set a start date. Set an end date 30 days after the start date. GO! Cross days off the calendar. Enjoy the positive changes. It’s so simple. It doesn’t require any deep thinking about human behavior and psychology. With the amount of information we have access to today, it’s so easy to become inundated with information about how to improve yourself. You read and read. You take on more and more information. You start to read conflicting ideas and beliefs. You begin to feel a sense of overwhelm. You realize you’ll never be able to consume even 1% of all the information out there. Before you know it, you’re drowning in information. It all just becomes too much. But it doesn’t have to be that way. When I first started this blog, I was completely overwhelmed by all of the information out there. But what I have to keep reminding myself is that I don’t need all of that information. All I need is a plan. My plan is to enact positive change through 30 day challenges. I pick a habit. I do it for 30 days. Boom. 30 day challenges are action-based. What the self-improvement world often lacks is a call to action. We have endless ideas but not enough exercises or practical guides. So let’s keep it simple, yeah? Nobody really knows how long it takes to build or break a habit. What we do know is that 30 days is enough to give you massive momentum going forward. Maybe the new habit will be cemented in your brain after 30 days, maybe it will take more time. Regardless, doing it for 30 days is enough to show you the positive benefits of any habit and to give you confidence in your ability to keep doing it. 30 day challenges actually tap into one of the main philosophies of 12 step recovery groups. The idea is that, to avoid overwhelming yourself, you simply focus on today. You have to complete or avoid a certain habit today. You don’t have to worry about tomorrow or the next month, just complete the challenge for today and worry about tomorrow when it comes. This allows you to work on the new habit in bite-size chunks. You complete the challenge today, you cross today off your calendar. No need to complicate things! Gamification is the idea of turning everyday processes into games. This is what 30 day challenges do for habit formation. I view each 30 day challenge as a game. I’m trying to make 30 X’s on the calendar. I’m facing off against myself and my impulsivity in a game of self-improvement. Gamifying things is an easy way to shift toward a more positive perspective. There is something that is so freakin’ satisfying about crossing off days during a 30 day challenge. I currently have 5 challenges going, and every day I look forward to making those big X’s after completing them. If you’ve never done a 30 day challenge, you’re going to love this part. I mentioned this a bit in the “gamification” section but 30 day challenges allow us to get competitive with ourselves. I view each challenge as a battle of my will and my desire to change against the part of my mind that wants to continue unhealthy behaviors. I am trying to do 100 push ups and 50 pull-ups per day. A part of my mind is always saying something like: “This is pointless. You don’t have time. You’re going to get sweaty.” But when I ignore those thoughts and just DO IT, I win. After completing all of the pushups and pull-ups, I feel a certain sense of victory. It’s a beautiful thing to be able to tap into your competitive fire and form/break habits. Alright, now that you understand the “why” of the 30 day challenge, it’s time to take action. Before we start, I want you to think of what habit or behavior you most want to change in your life. Okay…go! Now, I want you to think of the absolute first thing that popped into your mind when you read that last part. That should be the premise of your first 30 day challenge. You may have come up with something else after ruminating on it for a while, but I implore you to do the first thing you thought about it. Why? Because the first thing that popped into your head was likely the behavior the needs to be changed the most. It will likely be a difficult change. It’s something you probably don’t want to work on. On this flip side, this is likely a change that will bring immense positive change to your life. It’s a hard and fast rule that the difficulty of a 30 day challenge directly correlates to the positive effect it will have on your life. When I first started this blog, what came to my mind was quitting sugar. I was a sugar maniac at that time. I was eating 40-80 grams of sugar…just when I was supposed to be sleeping! Never mind the pints of Ben and Jerrys, the cookies, and the soda. I was a man on fire for sugar…and it was awful. So my first 30 day challenge was to quit sugar. It sucked. I had really difficult cravings at first. But as the challenge progressed, I started feeling so much better. I was no longer reliant on sugar to make me feel fulfilled. I was no longer a slave to the sugar rush. Had I done a simpler 30 day challenge, like the aforementioned 100 pushups and 50 pull-ups, I don’t think I would have had the same growth that I had through quitting sugar. The lesson in all this: make or break a habit that is holding you back! Pick the first thing that popped into your mind, I promise you will thank me later. Now it’s time to start. Take today’s date and search “30 days from today” on Google. The date that pops up is the end date for your 30 day challenge. I will go over tips, tricks and tools to help you out in the last section. For now, just commit to making this change in your life for 30 days. When it comes to 30 day challenges, the rules and guidelines are pretty simple. Do or don’t do something for 30 days straight. However, I want to address what happens when you miss a day. Missing day(s) of a 30 day challenge can throw off your entire challenge. Yes, it can curb your momentum, but it also gives your perfectionism a chance to kick in and wreak havoc. I personally failed my 2nd and 3rd challenges because I missed too many days and didn’t cut myself any slack. To account for missed days, I like to separate 30 day challenges into two tiers: standard mode and hard mode. After picking the habit you want to change in the last section, now you want to choose which mode you want to do. Read on for further explanation! This is a happy medium that allows us some mistakes without letting us completely blow the challenge. I am personally doing “Standard Mode” for all of my current 5 challenges. I am super busy on the weekends and don’t get a chance to complete all challenges. And I’m okay with that! This way I get to have fun and still keep moving in a positive direction. Hard mode is pretty simple: If you miss a day, you start the 30 day challenge over. Hard mode will result in much faster change, but obviously it’s much harder to adhere to. Why would anyone want to do hard mode? The main reason someone would choose hard mode is if the challenge involves addiction. When it comes to physically addictive behaviors, one mistake is a relapse and often negates all progress made so far. If you’re quitting smoking, you want to do hard mode. If you’re quitting caffeine, you want to do hard mode. If you’re trying to stop masturbating, you want to do hard mode. If you’re quitting drinking, you want to do hard mode. Hard mode is also a great option if you want to truly challenge yourself! I did it for the “No Sugar” challenge and it was a great challenge with great results. I think if I had missed some days, I wouldn’t have felt as good as I did when the challenge was over. Okay, did you choose a mode? Great! When it comes to 30 day challenges, you don’t need a ton of outside help. However, there are a few tips, tricks, and tools that I’ve found useful in my journey. Here they are! These printable calendars are the best way to track your progress. I also think printing them out and having them in hard copy makes the challenge seem “more real” than just tracking it through an app. So how do you create these printable calendars? A couple of ways. 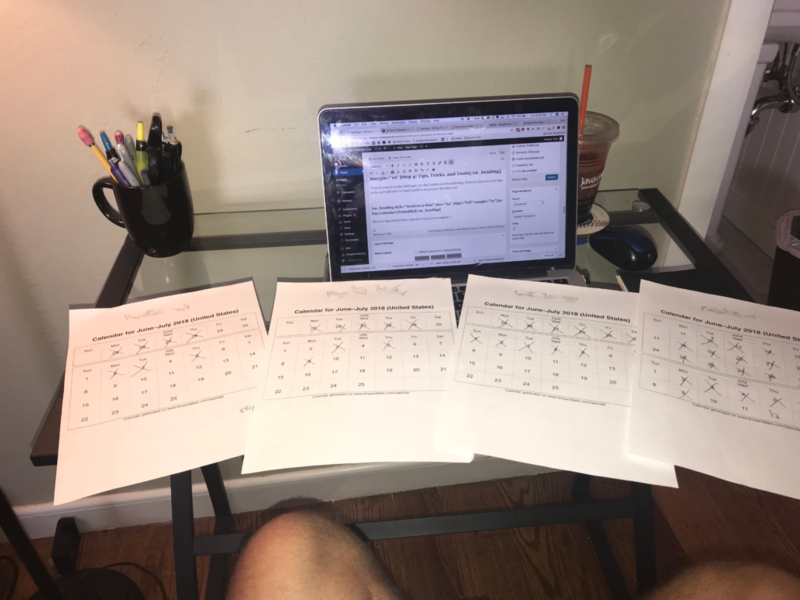 If you don’t care about actual dates and just want a 30 day chart to cross off, Detoxinista makes a great one that you can find and print here. Now you can print from this page, I also recommend that you bookmark this link so that you can create more 30 day calendars in the future. It’s pretty easy to make these calendars and I believe they make all the difference in tracking and staying motivated. Another tool that I found extremely useful was using my social networks to hold myself accountable. When I quit sugar, I made a post on Medium about it and then posted that on my Facebook. Knowing that everybody I was friends with on Facebook knew about my declaration to not eat sugar for 30 days, I really wanted to succeed. The thought of having to tell people I failed after making such a big to-do about it was honestly a little terrifying. If you’re comfortable with the idea, post about your 30 day challenge on Facebook. If not, tell a few friends who will help keep you accountable. Social support is a powerful tool when trying to make behavioral changes. The final tip I want to bring up is to get into a routine. Routine will help establish a time and place where you do this new habit. It can also help establish alternatives to a habit you are trying to quit. For example, I try to do my push-ups and pull-ups during breaks in my work. It gives me something to do to get away from work for 5-10 minutes and it also pumps me up and gets me going. I would recommend you start to look for ways you can implement this new habit into your daily routine, it’s the easiest way to get a 30 day challenge into autopilot mode.